In order for Halo to move forward, we need to understand its roots. Welcome to part 2 of “If I were making Halo 5”! 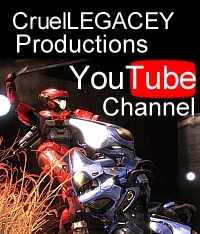 In part 1, I shared my thoughts on story and character development in the Halo series. Today, we’ll be looking at combat and level design in the campaign. Just like part 1, I’ll be using Halo 4 as a point of reference and moving forward from there. Halo is a very thoughtful FPS. Long before the release of Halo CE, Bungie was working on a form of Real Time Strategy game. As development moved forward, the game shifted to a first person perspective with smaller-scale battles, and Halo as we know it was born. But despite Halo’s transition across genres, elements of its RTS roots are still present. There is a Rock/Paper/Scissor dynamic to the combat systems. Weapon X beats enemy Y, weapon Y beats enemy Z, and weapon Z beats enemy X. Fighting a group of enemies in a Halo game is a bit like a game of “connect the dots”. To defeat that Hunter, I’ll need the Elite’s Fuel Rod Gun, to defeat the Elite I’ll need the Grunt’s Needler. To take out the Grunt from a safe distance I’ll need the Jackal’s Carbine rifle. Ok, go! This series of “dots” is what I call the Combat Ladder. The reason this system is so important is that it creates a level of strategic thought within Halo encounters that simply doesn’t exist in most shooters. You are always analyzing and prioritizing based on several factors, not just “which enemy is closest to me? I’ll shoot them first!”. It also encourages the player to use all the various tools in the sandbox. This keeps things fresh and exciting by avoiding repetitive use of any one weapon. In Halo 4, 343 managed to capture this dynamic fairly well during combat with the Covenant. But when it came to designing their own original enemy class, they broke the ladder. Of the 3 classes of Forerunner enemies, only the Promethean Knights drop weapons that are significantly useful. And even those useful weapons are direct analogs to other Human or Covenant weapons in the game. You still need to prioritize your targets, but in a far more simplistic manner: which of the bad guys in front of me are causing the most trouble right now? In most cases, that’s about as complicated as it gets. There is the added dynamic of the Watchers and their defensive capabilities. Do I try to kill the Knight first, or do I take out the Watcher first so I don’t have to worry about his interference? The problem is that you only need to answer this question once. In virtually every single encounter that involves Knights and Watchers, attacking the Watchers first is the better strategy. Fighting the Forerunners requires far less thought than fighting the Covenant. To make matters worse, all 3 classes of Forerunner share the same weakness. A long range precision weapon (like the DMR, BR, or Light Rifle) is the most effective utility weapon against Knights, Watchers, and Crawlers. There is very little incentive to ever switch weapons, unless you run out of ammo or find a power weapon. This makes fighting the Forerunners feel very repetitive. Proper implementation of the combat ladder is critically important for Halo 5. It is one of the key elements that has always made Halo games so much fun to replay. I had to force myself to complete a 2nd playthrough of Halo 4, in contrast with the dozens and dozens of times I’ve played through Halo CE, 2, 3, ODST, and Reach. A true Halo game requires just as much thought and planning as twitch reflexes. Let’s move on to my 2nd element: sandbox design. Level design in the Halo series has always been based on a pattern of large, open “sandbox” areas connected by paths or hallways that are more linear and focused in nature. This creates a great balance; the narrow paths allow more controlled experiences, while the sandbox areas allow the player to ‘play’ with the many tools at their disposal. These areas have traditionally been where the real Halo magic happens. Players can approach an area in whatever way suits their mood at the time, and get a different experience each time they replay it. In Halo 4, 343 got the basic flow of the landscape right, but faltered in how the many areas of each level are populated. The wide-open areas of Halo 4 rarely offer the player any form of choice other than “do I walk right or left”. Each location seems to be built with a very specific player approach in mind. That’s fine some of the time, but never do we get the opportunity to play with the entire sandbox at our disposal the way we could in previous games. Areas like the Scarab battles from Halo 3, the approach to the Control Room in Halo 2, or Tip of the Spear in Halo Reach allowed near-infinite replayability thanks to the array of different vehicles, weapons, and paths through the environment. 343 doesn’t seem to have a firm grasp on what makes Halo “fun”. You might enter a door and see an Elite with his back to you, moving towards his parked Banshee. If you act fast, you just might be able to take him down before he enters his vehicle, and claim it for your own! You pulled it off? Great!!! Except you’ll get blown to pieces within 10 seconds of liftoff because you are directly within the crossfire of at least a dozen enemies. Friendly forces have dropped off a Scorpion tank for you to use? Too bad you begin the encounter completely surrounded by Plasma Pistol-wielding Covenant troops: you barely have time to move before you’re EMP’d and defenseless against the approaching Wraith. Remember how much fun it was to drive the Warthog around the grassy hills while taking on squads of enemies in the beginning of Halo CE and Halo 3? Well here’s a similar area for you to recreate those memories… except you have no gunner. You’ll have to get out of the Warthog and cover this massive open area on foot, or park your Warthog at a safe distance and use the turret from long range while the enemy AI breaks down completely. Speaking of AI: The AI in Halo is fantastic. Very dynamic and adaptive. It only has one weakness: The majority of enemies in the Halo series have no idea what to do when you attack them from extreme long range. Yet Halo 4 constantly puts the player into situations where engaging from such distances is the only viable option. Huge amounts of time are spent unloading into enemy forces from long range while they dumbly shuffle from side to side, not moving to cover, not attempting to close the distance and engage. Never before have the enemies in a Halo game appeared so stupid. In my opinion, the “fun” equation is the single most important element to the future of the Halo franchise, and something that needs significant improvement in Halo 5. 343 has shown that they understand which ingredients to use, just not how to mix them all together. Nothing exemplifies this better than the 5th mission of Halo 4. Take a Mammoth with rocket turrets and a compliment of Marines and Spartan 4s, add in a couple Warthogs, loads of enemy vehicles, and a battle that stretches across miles of desert terrain: but somehow you end up with a level that is both dull and frustratingly slow paced. All too often, the missions in Halo 4 are built on exciting foundations of fan service, but fail to execute in a way that lives up to the potential of that foundation. Stop trying to recreate the great moments of past Halo games. Halo 4′s campaign is so obviously the result of a emulation checklist: “we need a tank section like ‘the Ark’, we need the moving platforms from Halo 2, we need a space section, etc. So let’s just look at those sections from earlier games and copy them, then find places to cram them in to our campaign”. In Halo 5 I want to see 343 take the franchise into their own hands with real confidence and create experiences from the ground up, based on what they think is fun. Staying true to what Halo “is” does not mean cutting segments out of past games and sticking them in to your new one. It means understanding the core systems, then letting your imaginations run wild. If 343 can do that, then Halo 5 will be in great shape. Thanks for reading! Stay tuned for part 3 of “What if I was making Halo 5″, where I’ll be discussing the future of Halo’s multiplayer! This entry was posted in Articles, Halo 4, Halo 5 and tagged articles, halo 4, halo 5, If I were making Halo 5. Bookmark the permalink. I’ve mentioned your analysis on the new Halo Waypoint. Hopefully it gets some attention. I can’t say enough how spot on your analysis is. Where is part 3? Been waiting for quite some time now for you to upload it. I had Part 3 pretty much done and ready to go, but I decided I wasn’t happy with what is put together. I’m re-working it slowly. Hopefully it’ll be done soon. Can’t wait! Your points on both parts are very insightful and well-formed. Hope 343i is listening. Once again a good read with great points (which I completely agree with). These points about what is lacking in the Halo 4 campaign are why I hardly play the game and haven’t completed it on Legendary yet. Which makes me sad because i played the crap out of Reach and still can go play it and have fun and new experiences every time. That was a heavenly read! I wholeheartedly agree with everything!!! I think you’ve pretty much summed up the problems I encountered with Halo 4’s Campaign. I did find the “backtrack prevention” to be utterly ridiculous (Aren’t continuous nav-points enough to guide the lost so those route-familiar need not lose their freedom? ), and wondered how everyone was finding Halo 4 so difficult when I, after 3 Legendary Solo runs, wasn’t; Because of the next to none “Set-up/Fallback zones”. And even if they existed, I highly doubt I’d have much opportunity to fall back to them, considering the punishing movement & melee speed of the Elites and the Promethean’s persistance pretty much made most mistakes fatal. So how does all these features like waypoint to every single location and backtrack prevention help newcomers when they’re always thrown into the thick of it with rarely a chance to retreat? Not much I’d reckon. Bid farewell to those supplies in the last room you were gonna go back for because the door’s gonna shut on you and tell you “WRONG WAY NEWCOMER OR INSURBORDINATE TO LINEAR STRUCTURE”. Anything further about the Sandbox from me would just repeat what you’ve described. And that brings me to the AI, which I have little complement to provide. The Covenant AI feels “copy-pasted” from Reach. Bad? No. The Enemy AI was at it’s peak of diversity & intelligence in Reach and it allowed veteran players to apply their past knowledge & strategies more easily. But the AI’s received tweaks, as 343 seemed to believe they weren’t challenging enough. This is obvious in the Elites, as mentioned before, with their movement speed matching player sprint speed exactly, so you physically cannot outrun them or chase them down, and their near-instantaenous melee strike speed makes a defensive melee attack completely irrelevant. And add the slow down upon damage when sprinting & their unflinching response to damage, these are not traits that added challenge for me, but rather punished me for relying on my adaptability & stragetic creativity, most especially in close encounters. As for Friendly AI, they felt “copy-pasted” from Halo 3, only downgraded. I remember Halo 3’s Friendly AI very fond of shooting dead bodies, but in Halo 4 it’s all they just about shoot, even when being shot! And another example was that the Enemy AI would attack at twice, maybe even three times the range of that of the Friendly AI, so if I ever wanted to take my Warthog at a distance & pick ’em off, it was an impossibility as the Friendly AI wouldn’t do it unless I went straight into the thick of it, and just stand and stare as a Ghost riddled my Warthog or a Wraith shot beared down on top of us. I feel comfortable saying that they are the worst Friendly AI of the entire Halo franchise. If it was a means to uplift the player, I consider it a complete failure. To uplift me as a player, I need to be surrounded by AI that can demonstrate competance & provide adequate assistance, but still depend on my presence. AI that is so unreliable that depending on them actually gets you killed more often than leaving them to their useless devices doesn’t uplift me, it just makes me feel like I’m the only one with any actual sense or response. As for the Prometheans, I have no major problems with. Frustrating to fight, particularly with how persistant watchers are even when fleeing, the instantaeneous recharge of Promethean shields, epecially after teleporting, but the faults are more minor, and at least do complement them as an enemy of superior technology, strength & intelligence. Beyond all of that would only repeat what you described. So yes, 343 has quite the amount of work to do if they hope for Halo 5 to be in much better shape than “Now 60fps and near-1080p”. And they have the resources & clearly the knowledge of the franchise to be able to do so. Now that the Xbox One’s hardware gives them much more room to apply them (as it’s obvious the Xbox 360 did not, even in the graphics), I feel that is when we shall truly see what 343 is willing & capable of doing. But again, I pretty much agree with you. Just watching that first video you posted made it strike me how much the areas are designed SO UNLIKE a Halo game. If this were Call of Duty, running over to an outcropping and poking out and popping heads would be easy and standard procedure. In Halo, with the tougher, more mobile enemies – and especially with vehicles – it makes you feel nothing but utterly trapped and disempowered. Halo NEEDs that bigger ‘set up’/’fall back’ area IMO that we were denied so often in Halo 4. As I recall from Halo 1, many of the enemies would often stick fairly close to cover at long range. This meant you either had to be really quick with a sniper rifle to get them, or come into mid-range and expose yourself. I’m not sure why Halo has drifted away from this. It was frustrating for learners, to be sure, but it’s made the combat less interesting at higher difficulties. While playing Halo 4, I see much less variation from AI characters. As far as I can tell, the Elites seem to switch between “standard behavior” and then “Shield down” behavior, and that’s about it. The enemies are all less dynamic than they used to be.